The 2019 INADR International Law School Mediation Tournament will be taking place in Athens, Greece March 14-17, 2019. Registration will open on this page November 30, 2018. Schools will be invited to register a first team, and request a second. The registration fee is $650 USD per team. Registration will close January 18, 2019. Teams will be notified if there is space for requested second teams on January 14, 2019. The tournament ends on Sunday, March 17th with a closing ceremony. For more information, the flyer of the tournament can be downloaded by clicking here. 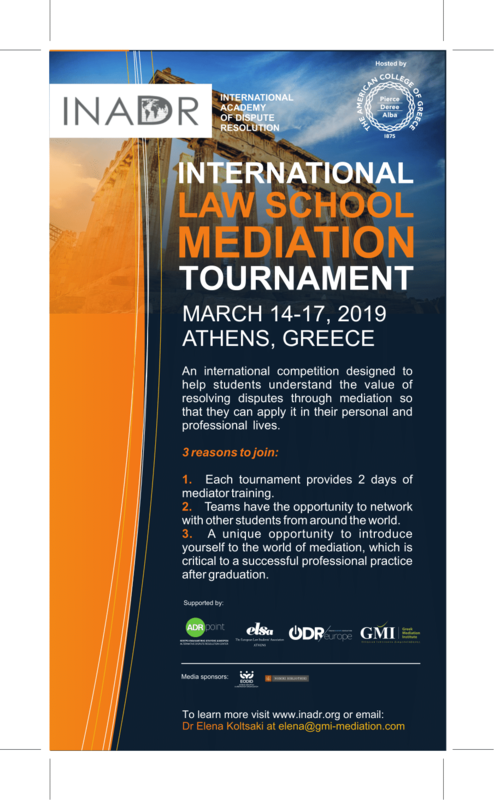 Registration for the International Law School Mediation Tournament taking place in Athens, Greece March 14-17, 2019. There is a cap of 52 teams. Schools will be able to register for 1st teams as soon as registration opens, and will be able to request a second team at that time. Second teams will be accepted on a first come, first serve basis at the closing of registration. New to mediation? Let us know if you would be interested in receiving introductory training. Please let us know about any special needs or dietary restrictions, such as how many vegetarian meals.